PITY the AFL staffers working on "risk and responsibility" - or whatever the AFL dubs "occupational health and safety". They sit at their Docklands offices in Melbourne reading the seemingly daily reports from the US of the billions of dollars in potential damages the National Football League could pay by the trauma of concussion. They have to spare the AFL from the same moment. Although it seems inevitable considering how several former VFL-AFL players, including Brownlow Medallist Greg Williams, are now consulting with US-based concussion experts who have changed the landscape in American sport. And the league staffers would naturally groan as every memo drafted to AFL football boss Steve Hocking recommending a rule change has the old guard threaten to revolt in anger while protesting about another rip to "the fabric of the game". In the past week there have been two moments that could - perhaps should - significantly change the debate. And they emphasise why the OH & S department at AFL House is increasingly more important than those working on the finer points of the Victorian State government deal keeping the AFL grand final at the MCG until 2057. First, there was Western Bulldogs premiership coach Luke Beveridge explaining the continued absence of 2016 grand final hero Liam Picken. Picken has not played since taking "friendly fire" from teammate Josh Dunkley in the pre-season, marking his second head knock in 14 months. He might not play an AFL game this year. "He's still getting dizzy spells," said Beveridge, "he's got headaches and he can't train with the footballs. "He cannot even cope with music in the four walls of the football club, so that's how extreme it is at the moment." How do you protect a player - and the sport, a contact-collision game - from crashing headfirst into a teammate? The call for all Australian footballers to wear helmets is far from supported as the definitive answer to concussion. 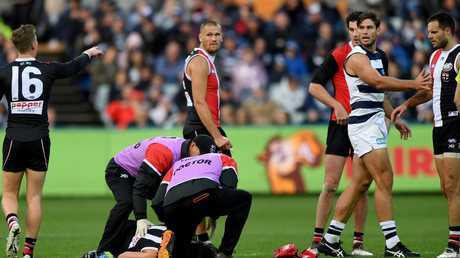 More visible - and shocking - were the images carried on television on Sunday afternoon of St Kilda defender Dylan Roberton collapsing at Kardinia Park as he moved with his Geelong opponent towards the contest at a centre bounce in the second term. 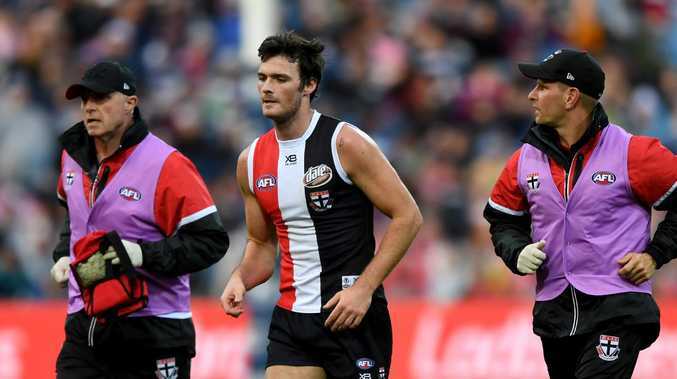 Earlier, Roberton - who was first diagnosed with an irregular heartbeat rather than concussion - had taken a heavy hit in another round of "friendly fire" in a marking contest. The Picken case reaffirms why the AFL - and players' union - must keep Australian football at the forefront of all studies on concussion. Team doctors must hold the ultra-alert tone in assessing and handling players after head knocks during games. The debate on whether players do return to the field a week after being concussed - even after passing all the medical tests - is worth another review too. 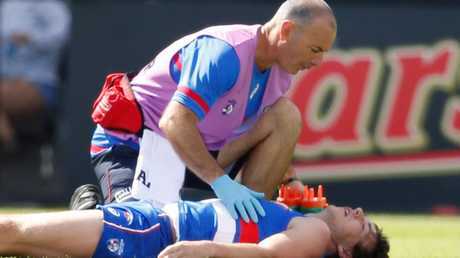 The Picken and Roberton moments should refocus the concussion debate with those in football's old guard who want to accuse the AFL of treachery to the "fabric of the game" every time there is a move to act on bumps and sling tackles. Australian football should be about carrying great memories into retirement - not losing those recollections to repetitive headaches, depression and dementia. And they should be able to listen to music too.